Kombucha is a living, fermented drink that brims with health benefits. It’s a drink that works magic on your body on multiple levels: it’s rich with antioxidants, it’s full of beneficial probiotics and its taste is nothing short of phenomenal. The drink is a transformation of simple ingredients – tea, water, sugar, bacteria, and yeast into something pleasant, healthy, living and happy. Nicolas Lavalliere, leader of LŌV Kombucha, wants to transform his kombucha business into something far more than just another drinks producer. Just like kombucha, this conscious business is a living, constantly evolving entity. Prior to starting LŌV Kombucha, you worked as an engineer in sustainable development. How did you get into the kombucha business? My sister introduced me to kombucha five years ago. She brewed her own ‘booch at home, and I fell in love at first sip. That first time, she had made a ginger and mint kombucha with gunpowder green tea from China. I loved the balance of sour and sweet and that touch of tang you can only find in kombucha. I used to brew beer when I was an engineering student back in Montreal, so it was an easy transition to brewing kombucha. When I moved to Spain with my wife Anna a year and a half ago, I found there were far fewer kombucha brands available than in Montreal. So I simply decided to start my own. What’s the kombucha landscape like in Barcelona? 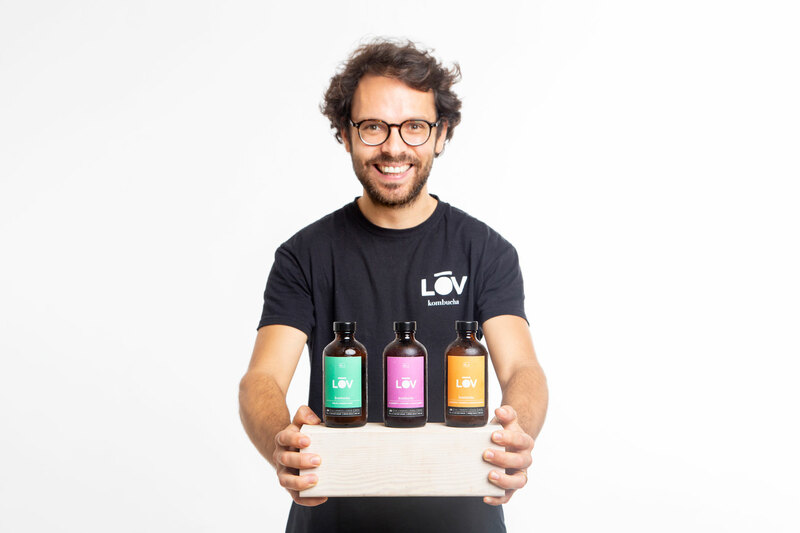 There are currently nine brands including LŌV Kombucha in Spain, but not all are available in Barcelona. In Montreal, there is an outstanding offer of different kombucha brands in every grocery store. That’s something I’d like to bring here. You’ve always had a conscious profession – first, you started in sustainable development, and now in kombucha. As a matter-of-course, you’ve taken on a conscious business model. Can you explain what that implies for a business? It was only natural to take on a conscious business model. My initial interest was kindled by Murray Bookchin’s the Politics of Social Ecology. The book talks about decentralized decision-making, which is a model that has always sparked by intrigue. When LŌV Kombucha was at its earliest stages, I was recommended the book Reinventing Organizations by Frederique Laloux. This book perfectly elucidated the organization I sought: it felt right and made sense to me, and it was the vision that I embraced. Laloux depicts one kind of organization for each stage of consciousness, assigning a color code to each. The main aspects observed in each organization are the method for distributing information, decision-making power and the respective breakthrough this approach represented once it became embedded in society. It might help if i try to briefly describe each stage of consciousness with its respective organisational archetype which Lalouz depicts in fascinating detail in his book. Red: The mafia, street gang or criminal organization. The red organization has a big boss and a lot of movement. Information is distributed top-down and the breakthrough is labor division and top-down authority. Amber: The army or religion. The first organization in human history that remains regardless of the people in the structure. If you change the Pope, Christianity remains. The main breakthrough is organization. Orange: The organization as a machine that you can tweak and optimize through overhead analysis. All large corporations more or less correspond to this color. This organization is focused on efficiency, innovation, and accountability. The structure remains top-down and both power and information still don’t flow well. Green: The family and value-based organizations. These businesses are driven by values and refer to stakeholders more than shareholders. Still, most resources and decisions are taken from a top-down perspective and real power is often not distributed. Teal: Just like kombucha, teal organizations are a living system built from many autonomous cells. These organizations are purpose driven. This is a fully horizontal organization divided into smaller autonomous cells. Everyone is involved in decision making and is invited to create and contribute following their own interest as long as it follows the evolutionary purpose of the business. LŌV Kombucha is a teal organization. Can you tell us more about its structure? Well, to be honest, I’m doing my best to implement the ‘teal’ vision. Right now, we’re still small – only five people, so it’s easier to operate this way. We currently work as an autonomous cell, but yes, we do plan to expand the company following teal guidelines. At LŌV Kombucha, we create a fund and share technological insights, research and development, and the brand communication tools. We have no top-down decision-making. Decisions are discussed within the cell and are agreed upon when we find the best solution. We make shared decisions even when it comes to remuneration. There are many ways to go about deciding how to pay an intern. For instance, some companies look at market rates for interns in Barcelona, others look on the internet or ask experts. That’s not how we work at LŌV Kombucha. We simply asked our intern how much she thought she deserved. And, as we expected, she gave us an honest and fair rate. We were happy, she was happy, and we stayed in line with our values. The same goes for company shares. Each of us put the percentage of the company we think we deserved into a basket. Again, it happened to all fit well. That’s an example of how LŌV Kombucha is working internally, but you also have an ecological and socially conscious approach, don’t you? We want to be part of a positive transformation. As crucial as it is to always look for ways to offset a negative impact on the environment or social ecology, more importantly, we are determined to add a net positive effect by how we do business. For instance, right now we’re in the initial phase of a project to create a working environment that is specific to migrant women, among other projects. The evolutionary purpose of LŌV Kombucha is about far more than making a nice drink. It’s about transforming life around us. What are LŌV Kombucha’s main values, and how do you implement that in your business? LŌV Kombucha is founded on four main values: transparency, empathy, trust and accountability. We work at every problem through these four steps. Are we being transparent, empathic, trusting and holding ourselves accountable? We aim to be fully transparent within our organization and with our consumers. Anyone will be able to see how much we are paying ourselves and our staff, how we use our profit, how we manage our funds whether we re-invest in development or use it for wage increases. We are proud of how we work, even if this means failing sometimes. For us, instances of failure are inherent and indeed critical to how any organization evolves. What’s important to us is how we react and what we learn. And frankly, it’s good for business – companies that apply these principles have far fewer overhead costs than other kinds of business models where there is enormous expenditure alone on internal systems whose sole purpose is to prevent such moments of failure. How will this structure work when LŌV Kombucha grows? Small, self-managing structures are said to be effective up to the point when they reach 15-20 people. Thereafter you need to start breaking them down to a federation of small self-managing structures. We’re not there yet, but we plan to be soon. When our current cell gets too big, we’ll start another, and they’ll be free to manage things the way they want. We’ll share funds, resources, and the brand, and we trust them to do the best with it. People always work best when they’re empowered and can feel ownership over the business. It’s hard to imagine. You have to understand exactly what it means to be self-managed. People aren’t used to working in a self-managed structure. We aren’t used to having all the information, all the possibilities, and having a say in the important decisions. In too many jobs, people repeat the same tasks day after day. That’s not what LŌV Kombucha is about. It’s about having the opportunity to change people’s lives by allowing them to find their true north as long as it is aligned with the evolution of the company. Personally, I want to grow enough to be financially healthy – to make enough sales to pay the bills, have a decent salary and be able to share the model with other conscious entrepreneurs. At LŌV Kombucha, there are no shareholders to satisfy. We’re not looking for that kind of support. If you aren’t a social investor – if your purpose isn’t to change people’s lives – look elsewhere, there are tons of other options. We’re here to recreate the landscape, inject consciousness into the market, and we’re excited to see how we can transform it. Want to know more about the transformative properties of kombucha? Read about them here! previous post: Kombucha benefits: what does science say?